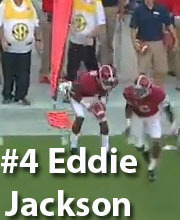 “What’s going on” With CB Eddie Jackson? So have you been wondering about the super-freshman cornerback that played so excellently in the 25-0 shutout at Ole Miss? With no action in LSU or Mississippi State games, it is a pretty common question among Alabama fans that are asking the same thing. In fact, on the Thursday night call-in radio show, Hey Coach", one fan asked Nick Saban point blank what is "What's going on" With CB Eddie Jackson?" With some of the footage of Eddie Jackson going the wrong way on a coverage & sitting down with the offensive lineman during stretching drills, it is not a stretch to believe that the kid is having some growing pains at Alabama. Saban went on to explain that it is pretty par for the course for a freshman. He answered the question by saying, "That's kind of up to Eddie Jackson," Saban said. "I think it's our responsibility to kind of play the best players. Eddie had an opportunity to play early on. "The biggest thing with the freshmen that everybody needs to understand is these guys have a hard time sustaining the level of intensity that you have to have to be able to sustain a season. They get excited about playing a game or two and then all of a sudden, they can't focus on their technique, they can't go out and practice every day and do what they're supposed to do, they can't take another game plan." When more veteran players Cyrus Jones and Bradley Sylve have been healthy (Sylve has had some ankle ussues), the services of the youthful cornerback Eddie Jackson has not been needed as much. This will let the youthful talent learn the system better in the long run without getting burned. Saban said that Eddie Jackson & Maurice Smith (another freshman cornerback with action this year) are "both two freshman players that are going to be really, really good players, but it takes time for these guys to develop, especially at their position where one mistake is a total exposure." Saban assured the caller that there is "nothing wrong" with Eddie Jackson, but that he was just being a "normal freshman." Here are some clip of one of Eddie's most famous plays, a targetting play that was actually overturned.